Despite the title, which was imposed by the publisher, the volume that appeared 20 years ago was by no means a "complete book" on the subject; nor is it now a contemporary guide. However, you can still find it on Amazon, even though Amazon.com did not exist when the first version was published. The images immediately on the right are the current Amazon listings of the three versions (which I will explain shortly). 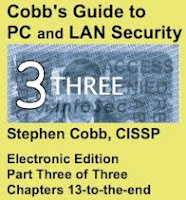 The goal of personal computer security is to protect and foster the increased creativity and productivity made possible by a technology that has so far flourished with a minimum of controls, but which finds itself increasingly threatened by the very openness that led to its early success. To achieve this goal, you must step from an age of trusting innocence into a new era of realism and responsibility, without lurching into paranoia and repression. I'd say that's a decent piece of prognostication for 1992. It's one of the reasons I have kept the book available all these years, a mix of nostalgia and history. At some point in the future it might be interesting to see what computer security looked like in the late 20th century. 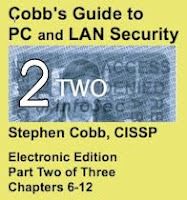 I made a lot of changes when I turned that 1992 volume into The NCSA Guide to PC and LAN Security--a 700 page paperback that was published in 1995--but that edition is also very outdated these days. 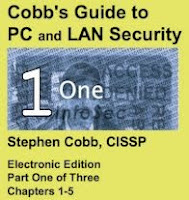 Around 12 years ago I obtained the copyright to these works and, through an arrangement with the Authors Guild, got it reprinted as Cobb's Guide to PC and LAN Security. This was done largely for sentimental reasons and the copies are only printed on demand. However, in that process I obtained a high resolution scan of the entire book. I then converted this to text using Adobe OCR software. The result is what I have put online. (Warning: you may encounter OCR errors and artifacts; no claims are made as to accuracy of the information in this document; use at your own risk and discretion). LEGAL STUFF: THIS FREE ELECTRONIC EDITION IS LICENSED BY THE AUTHOR FOR USE UNDER CREATIVE COMMONS, ATTRIBUTION, NONCOMMERCIAL, NO DERIVATES. 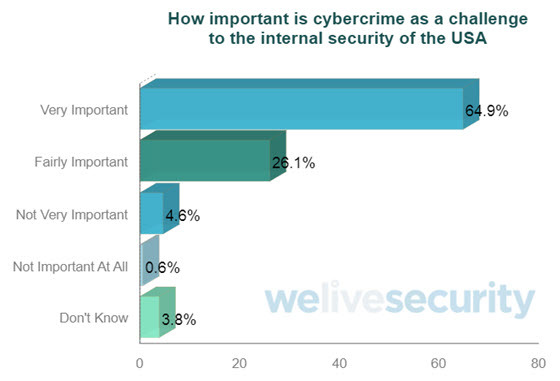 The most cost-effective long-term approach to personal computer security is the promotion of mature and responsible attitudes among users. Lasting security will not be achieved by technology, nor by constraints on those who use it. 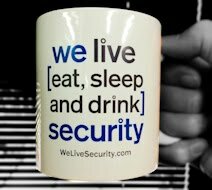 True security can only be achieved through the willing compliance of users with universally accepted principles of behavior. Such compliance will increase as society as a whole becomes increasingly computer literate, and users understand the personal value of the technology they use.